Choosing one special ingredient can transform an ordinary meal into an elegant one. 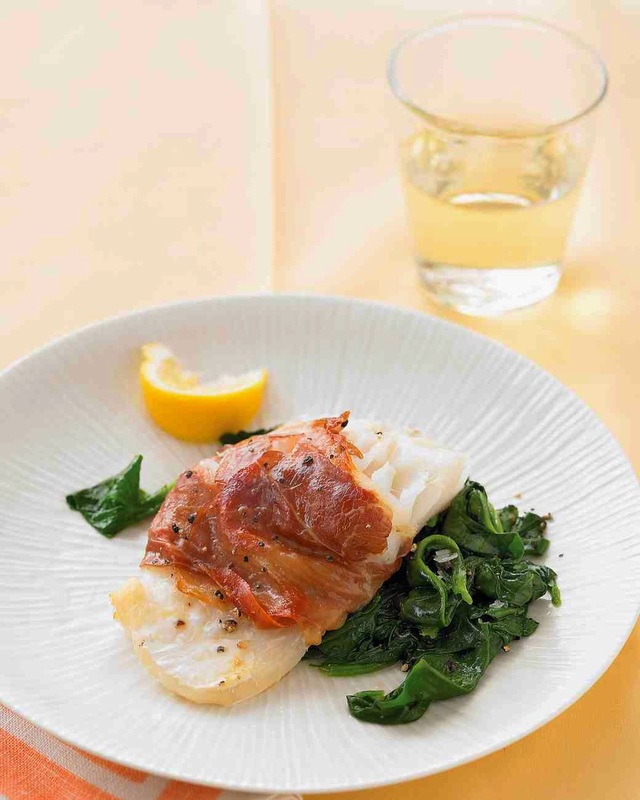 Here, slices of paper-thin prosciutto -- salt-cured Italian ham -- dress up cod and sauteed spinach. Heat broiler, with rack set 4 inches from heat. Season cod with salt and pepper. Wrap 1 slice prosciutto around each fillet; rub with 1 teaspoon oil, and place, seam side down, on a broilerproof baking sheet. Broil until prosciutto is browned and fish is opaque throughout, 8 to 12 minutes. Meanwhile, in a large skillet, heat remaining 2 tablespoons oil over medium. Add as much spinach as will fit in skillet; season with salt and pepper. Cook, tossing and adding more spinach as there is room, until wilted and tender, 4 to 6 minutes. Sprinkle with lemon juice; toss to combine. Serve cod with spinach and lemon wedges.